352nd day of the year. There were then 13 days left in 2018.
on the 51st week of 2018 (using US standard week number calculation). 88th day of Fall. There were 3 days left till Winter. Sanders said today the WH is not looking for the taxpayers to pay for the wall while at the same time said the WH is looking to other agencies to find wall funding. Is @presssec aware that agencies of the federal government are funded by taxpayers? 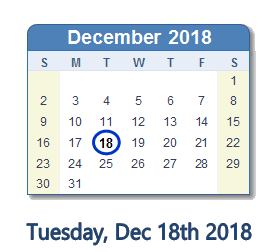 What happened on December 18th 2018? Steve Hilton: Hey, Trump haters (on both sides) could you just admit that this is a successful presidency?